I’ve noticed how they’ve been making more efforts to improve the look and functionality of their website, and I gotta say, this update is fantastic. The previous one, where they streamlined things and added the Dashboard, was a good starting point since it made the site a lot more organized and easier to navigate. But now…now it’s even better! The new design is clean, bright, and even more streamlined than before. You can easily access all the types of lessons from one spot: the sidebar. When you select one of the categories, you can choose to add certain courses to your dashboard, follow a course through RSS, or explore the curriculum of the course. You can expand sections to see more info, or collapse them to see less. The downside to all of this new stuff is that there is a bit of slowness when switching between categories and while arriving at the actual lessons because of the time it takes to load the lists and the audio player, respectively. But the audio player is one of the best parts of this new update, so I don’t mind that much. You can now skip ahead without having to wait for buffering, and manipulate the audio in other ways such as speeding up and slowing down. The skipping ahead part is what really makes me happy, because I don’t want to sit through explanations of words or phrases I already know well–something I used to do, which made tuning into the podcast a little less exciting. But today I did three lessons and was quite excited to do them! 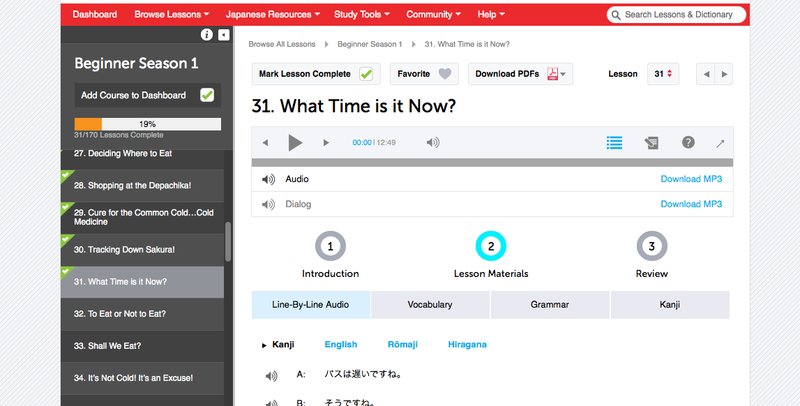 In lessons, activities are now divided into three “steps” consisting of an introduction, lesson materials, and a review. As a premium member, I have it set to the lesson materials tab (Step 2) and immediately have the line-by-line audio right there underneath the audio player, defaulted to kanji so I don’t have to try to ignore romaji! (You can choose to view in kanji, hiragana, romaji, or English, but kanji is default.) I don’t necessarily have to download the PDF this way either. This update is just SUPER nice because it’s so easy to find where everything is now! I definitely think I will be returning to JapanesePod101.com more often thanks to this! I need to do a proper review of it for sure. Posted in Japanese LanguageTagged audio, design, japanese, japanesepod101, lesson, podcast, review, updateLeave a Comment on JapanesePod101 Got a Major Update!